Many of the jazz enthusiasts who attended last weekend’s Jazz in the Pines event didn’t know it was a scholarship fundraiser (although it was clearly written on all of the promotional materials). When she was told by another attendee that the money raised from the jazz fest went to student scholarships for the Idyllwild Arts Academy, she was impressed. At least three scholarship students performed live at this year’s Jazz in the Pines event, including Jacob on sax, Caleb on trumpet and Connor on trombone. Marshall Hawkins, head of the Jazz Department at Idyllwild Arts, always invites his Idyllwild Arts jazz students (and some classical students) to play with his band, the Harry Pickens Trio. Not only did they play with him on Sunday, August 29, but he showed them off to the crowd. She said that she saw Jacob afterwards while waiting in line for the shuttle, and asked him if he was nervous about being singled out. Little did the fans know, but Jacob, Caleb and Connor, had been practicing all summer for that very moment in the spotlight. 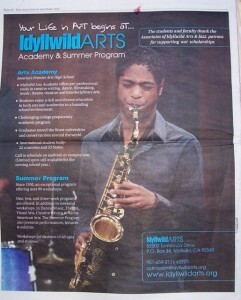 Caleb was a teacher’s assistant during one of the summer school sessions at Idyllwild Arts. Jose, who lived in the same dorm and heard him play at concerts, was impressed with his dedication. Jacob knew that he’d be playing at the jazz fest when school ended last June. “Come and hear me play at the Jazz Fest,” he told his friends and teachers. 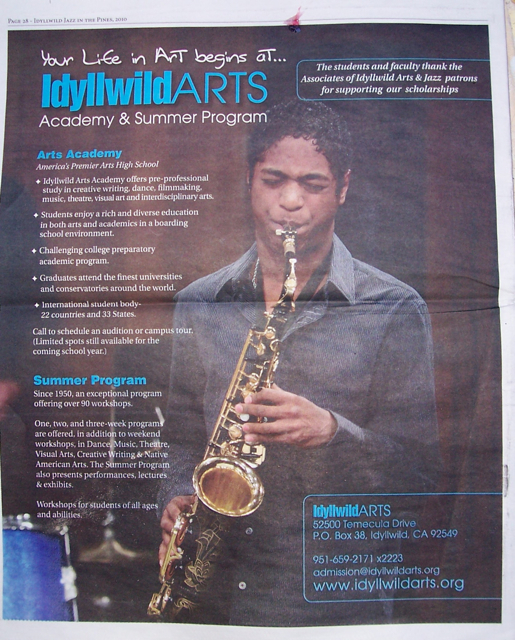 In fact, a photo of Jacob was featured on a full page advertisement on the back of the jazz fest program. It showed him intently playing his sax. Connor, who lives in Palm Springs, and spent his summer tutoring grade school music students in his dad’s office, was also ready for his solo at the jazz fest. For them, to be in front of a live audience, especially one that understands and appreciates jazz, was quite the thrill. For most of the year, they play before select audiences made up of friends and faculty. Mariya, a classical bass player who had a four-year scholarship to Idyllwild Arts, also played with Marshall Hawkins at the Jazz in the Pines last year. Since then, Mariya graduated and earned a full scholarship to The Colburn School of Music in Los Angeles. She hopes to come back and play with the Idyllwild Arts Student Orchestra as a “ringer” (a professional player) sometime this year. Ticket sales at Jazz in the Pines 2010 must’ve been good this year.